The Murti Pratishtha Mahotsav celebrations at Shree Swaminarayan Temple Los Angeles continued on Friday, July 20th, 2012. Early in the morning, Acharya Swamishree commenced the Vedic yagna ceremony, which is an important ceremony that allows Lord Swaminarayanbapa Swamibapa to come and accept the new temple as His abode. However, before the ceremony began, the sinhasan curtains were drawn open for the first time to reveal the beautiful new marble murtis of Lord Swaminarayanbapa Swamibapa. This was the first time the disciples were able to have the divine darshan of these murtis, and they were all extremely pleased to do so. After Acharya Swamishree finished performing the first segment of the yagna ceremony, He was escorted outside the temple to perform the ribbon-cutting ceremony for the American Red Cross blood drive that was taking place in the temple’s adjacent building. Donating blood is considered to be a great seva by the Lord, as it benefits humanity and helps save the lives of other human beings. Swamibapa Pipe Band then led a swagat yatra from the temple’s rear parking lot to the main entrance during which Acharya Swamishree was adorned in beautifully-decorated vagha. 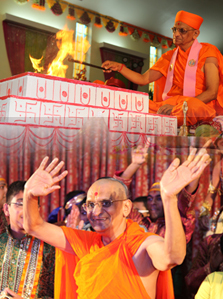 Acharya Swamishree then performed the ribbon-cutting ceremony of the temple at the main doors. As Acharya Swamishree cut the ribbon and step foot inside, the temple was officially open to all moksh-seeking souls who enter the temple for the divine darshan of Lord Swaminarayanbapa Swamibapa. Acharya Swamishree was escorted to the front of the temple by Swamibapa Pipe Band and disciples as He placed His divine lotus feet on fresh flower rugs and rangoli designs that disciples had created and placed along the center aisle of the temple. As soon as Acharya Swamishree reached His gadi, He stood upon it and began to dance as the kirtan “Jay Jay Shreejibapa” began to play in the background. The entire congregation was on its feet rejoicing along with Acharya Swamishree. Afterwards, Sadguru Shree Jitendrapriyadasji Swami began the recital of the Vachanamrut Rahasyarth Pradeepika Tika scripture. Following the scripture recitals, the Los Angeles Police Department officers of the Van Nuys area and members of the Mid-Valley Community Police Council were welcomed into the temple as honored guests. Several of the guests shared kind words of congratulations to the temple and welcomed the congregation to the Van Nuys family. They were also extremely pleased to be in the divine presence of Acharya Swamishree and the fantastic grand opening celebrations. Captain of the Van Nuys squad, Paul Snell, presented Acharya Swamishree with an honorary plaque for the temple’s generous support of the Police Department. Acharya Swamishree then presented Paul Snell with a $1500 check for the Mid-Valley Community Police Council to go towards the many beneficial community programs that it organizes. Acharya Swamishree then asked the police officers to join Him and the disciples in inaugurating the new CD “Pyare Shreeji Ho Tum” that features kirtans from the Bhuj Ghanshyam Maharaj Suvarna Pratishtha Mahotsav. All of the officers and council members were honored with prasad paags, garlands, saals, and certificates. His Divine Holiness Acharya Swamishree then commenced His divine ashirwad. Acharya Swamishree informed the assembly that all the progress of the Karan Satsang in the United States is due to the sacrifices and hard work of our beloved Gurudev Jeevanpran Shree Muktajeevan Swamibapa. The fourth temple of Maninagar Shree Swaminarayan Gadi Sansthan in the United States is located near Hollywood, Los Angeles, California – an attractive destination for travel. With this beautiful temple now close to Hollywood, souls will be attracted to it, and they will achieve salvation upon the divine darshan of Lord Shree Swaminarayanbapa Swamibapa. Acharya Swamishree went on to explain that the scripture that has been chosen for the parayans during this Mahotsav is the Vachanamrut. In the 1800s, Lord Shree Swaminarayan manifested on this Earth in the form of Jeevanpran Shree Abji Bapashree. Bapashree gave us the Rahasyarth Pradeepika Commentary as a supplement to the Vachanamrut to better understand the Vachanamrut scripture. The prowess of this scripture is extraordinary, and we should make every effort to read and understand it. He then spoke to the congregation about peace and unity, as the Murti Pratishtha Mahotsav has also been called the “Festival of Peace and Unity.” People do many different activities in an attempt to achieve peace, but they are unsuccessful. Peace can truly be achieved through devotion (bhakti). One of the reasons behind building temples is so that disciples can go there and perform devotion to the Lord. People work day and night to do many things in order to feed the five senses (vishays), but this only leads to temporary bliss and peace. For example, one can buy a really expensive bed, but what good is it if he or she cannot sleep well at night? Only the Lord has the ability to give eternal bliss, and we can achieve this by performing devotion to Him. Acharya Swamishree then preached about the concept of unity. People quarrel with each other all the time, and these quarrels are due to evil nature and not being satisfied with one has been blessed with. People become jealous over what others have and greedy over what they have and never live peacefully and united with one another. If we look closely at the root cause of all these quarrels, one will always come to the same conclusion that these quarrels occur as a result of people not being able to control the heart (man) and the indriyas. These quarrels are about land, money, food, and worldly endeavors. We should stop all of these quarrels because we have already achieved the Supreme Lord Shree Swaminarayan, so what else is there to desire? Having the Lord is the biggest benefit to souls, greater than any land, money, or food. The Lord gave us this human birth, which is almost impossible to have in the first place given the millions of other species that exist on this earth. Not only did He give us a human birth, but He gave us birth in the Karan Satsang to perform devotion, please God, and achieve eternal salvation. None of these worldy objects or even relatives is ours. They are ephemeral, and only Lord Shree Swaminarayan is eternally ours. These objects or relatives will not help us achieve salvation; only the Lord will. We must falsify everything and take shelter under Shree Swaminarayan Gadi. After imparting this very valuable words, Acharya Swamishree finished His divine blessings for the morning, and the Swaminarayan Gadi Jay was recited. Hence, the morning sabha concluded, and everyone was served maha -prasad lunch in the tent behind the temple afterwards. In the afternoon, Acharya Swamishree, sants and disciples gathered back inside the temple for the afternoon sabha. Sant Shiromani Shree Gurupriyadasji Swami continued the recital of the Vachanamrut scripture, and afterwards, Acharya Swamishree inaugurated a door banner that displays the divine murtis of the Guruparampara. This was distributed to everyone present at the Mahotsav. He instructed that we should be prudent and disciplined, for if we are not, none of the intellect we have matters. We should not be proud of and rely only on our intellect because if we do, we become egotistical. Acharya Swamishree then explained that we cannot obtain the Lord by merely reading scriptures. We must associate with the Lord’s Satpurush and sants to truly understand the scriptures and behave accordingly. There are many types of ego and pride – ego of having extensive religious knowledge, wealth, property, beauty, etc. These egos will only diminish if one surrenders himself or herself at the lotus feet of the Lord and His Satpurush. We should recognize any ego within ourselves and all of our mistakes, apologize, and always be eager to please the Lord. With this, Acharya Swamishree concluded His divine blessings. Samuh parayan sponsors and murti sponsors were then given the opportunity to perform aarti to Lord Swaminarayanbapa Swamibapa and receive blessings from Acharya Swamishree. After this, Acharya Swamishree performed sandhya aarti, everyone performed daily evening niyams, and maha-prasad dinner was served to all. After maha-prasad, around 8:30 PM, everyone gathered in the temple for the evening’s devotional and cultural performances. Young disciples from the California, New Jersey, and the Mid-Atlantic mandals sang the American and Indian national anthems, played the piano, sang many devotional songs (kirtans), performed several devotional dances, and performed a short religious drama to please Lord Swaminarayanbapa Swamibapa and Acharya Swamishree. The young disciples showcased all of their various talents to please the Lord, and the performances were enjoyed by all who were present. At the end of all the performances, Acharya Swamishree went up to the stage to bless all of the young disciples who participated in the evening’s devotional program. The kirtan “Pyare Shreeji Ho Tum” then began to play, and Acharya Swamishree delighted the entire congregation by dancing joyously. As the kirtan features some classical Indian music, Acharya Swamishree incorporated some traditional dance steps as He moved. As a sant, Acharya Swamishree was very talented in Indian classical dance and used to dance on many occasions to please the Lord and Gurudev Jeevanpran Shree Muktajeevan Swamibapa. The kirtan “Jay Jay Shreejibapa” started to play, and as soon as the chorus came up, the entire congregation was on its feet along with Acharya Swamishree. Sants got up to join Acharya Swamishree and disciples on stage. The temple’s atmosphere was absolutely filled with bliss. This evening finale ended yet another fantastic, memorable day of the Mahotsav.